Someone asked a question on LinkedIn and it reminded me of a topic I wanted to write about in this blog. I’ll use the opportunity to post my response and elaborate a little about it. The question was related to the electrical grid in this country and what can be done to improve it. I think that instead of increasing the capacity of the grid, we should focus on adding electrical generating capacity closer to the point of use. This would save the need to have to construct new power plants which cost billions to construct and transmission lines, which cost as much as $500,000 per mile, and make the system more resistant to wide spread outages. National electrical grids are among the largest and most complicated machines ever to be constructed by man. Their inter-connected nature has made them vulnerable to cascading failure effects when a problem strikes just a small portion of a grid. There have been several instances in just the past few years in the U.S. where a fallen tree branch or sagging lines in some remote area has caused outages for hundreds of thousands of customers in multiple states. A more robust solution would be to have power generated closer to where it’s used but this is not typically done because it’s more profitable for utilities to build large scale generating plants and deliver electricity to many customers over the grid. There’s no profit motive for them to have other sources competing to provide electricity to their customers. Electrical power generation equipment has three principal costs: capital, operating/maintenance, and fuel. The ratios of these costs vary considerably depending on the type of generating equipment. For example, nuclear plants have low fuel cost relative to other generating equipment, but higher capital costs. Renewable sources such as solar and wind turbines have no fuel costs, but they also have fairly high capital expenses, as well intermittent generating characteristics. Natural gas plants have lower capital costs, but have some of the highest fuel costs per kWh generated, especially when used for peaking loads. Fuel availability and delivery cost often drive the decision on where to locate power plants. This is especially true in the case of coal because it is heavy and must be delivered by rail thereby adding to its cost, sometimes significantly. And, of course, pollution concerns tend to make it difficult to locate coal plants near the populations they serve. In some instances, power plants have been built near coal mines to reduce the cost of fuel delivery. More than half of the energy in nuclear, coal, and natural gas is lost as waste heat when used to generate electricity. Because these plants can’t easily distribute this waste heat, which could otherwise be used for space heating, they dump it into the atmosphere. Instead of adding more generating plants, I would propose that homes be equipped with small 1 kW natural gas-powered electrical generators which, during the winter, generate electricity and utilize the unavoidable waste heat for space heating needs. About 50% of U.S. homes use natural gas for heat and the ratio is even higher in colder climates. This way, the natural gas energy used for electrical generation could be more efficiently utilized while reducing the need for adding capacity to the grid in the form of extra power plants. In addition, the homes could be equipped with solar panels for generating electricity in the warmer months when there is no need for space heating and when sunshine is at its maximum. In addition to connecting each home with a grid tie inverter to sell back any excess electricity to the grid, a battery bank (~24 kWh) could store a day’s worth of electricity for use when the sun wasn’t shining and to help level the effect of overloading the grid when the sun is shining but demand is low. Overloading the grid will become a bigger issue when grid-tied solar installations grow in popularity. The natural gas electrical generator would also be available when the electrical grid goes down. 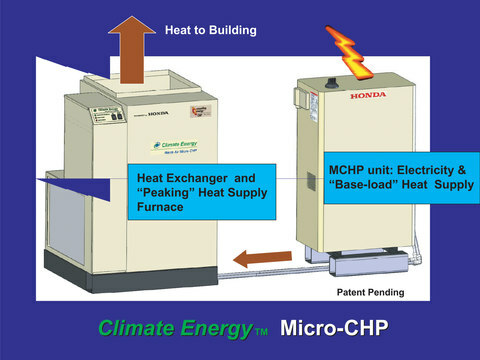 This concept is similar to micro combined heat and power (Micro CHP) and is not really that new. There are more than 50,000 home installations of Micro CHP in Japan already. My proposal adds a local storage battery bank and solar panels. This forms a sort of redundancy in the event of a grid outage, helping to guarantee that electrical power and heat will be available even when the grid goes down. It also helps to compensate for the reduced sunlight conditions in northern climates during the coldest months when solar panels tend to generate at their annual minimum. The cost for a small generator is not that much. I purchased a new 1.4 kW gasoline powered generator recently for $300. Since a grid tie inverter is already part of the solar system, the gas generator could easily tap into it as well. My reason for getting the generator was because I realized that if the electricity goes down in the winter, my furnace will not operate. My gas furnace uses a computer to control it, in addition to a 750 watt blower motor, so with this generator, I’d be able to keep my house warm and prevent my pipes from freezing in the event of a prolonged power outage. There are a few complexities with this system, the primary one which is to make sure not to ‘back feed’ electricity into the grid during a power outage. This is to protect the safety of the electric utilities linemen. But I know how to disconnect my furnace and plug it into the generator without back feeding electricity into the grid, so I’m comfortable with this solution. In pondering about it, I began to wonder if it wouldn’t make sense to equip every household with a small backup generator that fed off of the natural gas line so that a power outage wouldn’t pose as much of a threat. I realized after looking around the web, that it was already being done in Japan and is available in the U.S. Granted, it’s not cheap, at least not yet, but in light of the costs of a solar system, it seems like a small cost adder to solve several other problems at the same time. The battery would be useful to level the solar output to the grid. The utility company can’t easily throttle base load generating equipment such as nuclear, coal, and combined cycle gas generators, so they will likely start objecting to having too many grid-tied solar customers. The household battery could level out solar output and also provide the necessary emergency power during the time when the grid went down and before the natural gas generator was started. The battery could even connect up to a network and decide when to put the energy out on the grid to help offset peaking loads, thereby making it unnecessary for utilities to keep standby generators to handle the peaks. This concept is related to the smart electrical grid which we have been hearing more about lately. The utility scale standby generators are very expensive for the utility companies to own because their capital costs can only be amortized over a small number of hours of operation per year and gas peaking generators are single cycle, which means they have lower efficiency than combined cycle generation and thus much higher fuel costs per kWh as well. previously been thinking about figuring out a way to go 100% solar, but then December rolled around and I started looking at the number of days that the sun is not available. It reminded me that all renewable energy systems still need to have backups, particularly in the winter, and natural gas seemed to best fit the bill. Natural gas can work as both a fuel for generating electricity as well as space heating and with this proposal, it would be about 85-90% efficient, and that is considerably better than even utility scale power generation. The overall effect would reduce not just natural gas consumption which is used to produce 20% of our nation’s electricity, but it would also reduce coal consumption which produces 50% of our electricity.